So says our protagonist, Annabel (Jessica Chastain), when it transpires that the orphaned young nieces of her boyfriend, Lucas (Nikolaj Coster-Waldau), will be entering into the couple’s care. The statement is frank but understandable. The children in question, Victoria (Megan Charpentier) and Lilly (Isabelle Nélisse) have been found living in feral conditions in a remote shack years after being abducted by their father, Jeffrey (also Coster-Waldau), who snatched them following his murder of their mother. If this did not provide enough trauma to “screw up” the two girls, they also have another ward: the titular Mama, a spectre who raised them in the wilderness and who is now none too pleased at the prospect of their being re-homed. I begin by quoting the above line of dialogue because it draws out several of the central concerns of Andrés Muschietti’s Mama. Annabel’s blunt assessment of her situation invokes the central role of parental responsibility in creating child or adolescent “monsters” in the horror genre, and also suggests the immaturity (at this point in the narrative) of our beer-swilling, rock band-member protagonist. Over the course of Mama, Annabel and Victoria will learn to adjust and adapt to traditional social roles within the mother/daughter dynamic. Mama and Lilly will act as a monstrous mirroring of Annabel and Victoria at the film’s climax. Both sets of mother/daughter pairings demonstrate the presence of the maternal instinct in unlikely places, as well as the power with which the maternal is imbued in the horror genre. 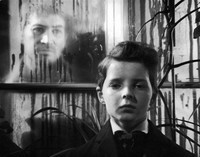 The role of the family unit in creating or fostering the monstrous child is seen by Robin Wood as a central concern of post-1960s American horror cinema. Although Wood argues that the “Terrible Child” is situated as a product of both functional and dysfunctional families, it is nevertheless more common in the genre to find “horrific” children emerging from the broken or dysfunctional family unit. The “horrific” representation of children in horror is frequently attributed to their lack of a stabilising family structure, the assertion for dominance and blurring of socially appropriate, separated adult and child identities caused by the children’s longstanding lack of conventional parental figures. Mama belongs to a particular strain of horror - alongside earlier efforts such as The Innocents (1961) and The Shining (1980) - that depicts child characters who are implicitly “screwed up” by natural and supernatural, human and inhuman, families or family surrogate figures. The child who suffers at the hands of an abusive or oppressive parent, or who otherwise belongs to what is considered a broken, damaged or dysfunctional family unit, is time and again presented as being more susceptible to supernatural forces, particularly when those forces act as a surrogate for the parent(s). This is true in the case of Mama, which provides real-life horrors in its opening pre-credit sequence that will inflect and intersect with its supernatural ones. The opening shot - a car crashed into a tree outside of a grand looking home, its ‘N1-DAD’ license plate visible to the viewer - immediately alerts us to the (self-)destruction of the wealthy, “safe” upper-middle class environment that has become increasingly figured as unstable in the current recession era. Voiceover from a radio report alerts us to the breakdown and disappearance of Jeffrey Dessange, tellingly described as an “analyst” and “senior partner” (terms that now evoke economic catastrophe) and, as we quickly infer, the owner of the vehicle. These opening moments juxtapose symbols of wealth and status - the yapping dog, the opulent picket-fenced home, the chandelier, the toe-curling vanity license plate - with homicidal breakdown, as the sounds of gunshots alert us to Jeffrey’s murder of his wife, the biological mother of Victoria and Lilly (who is tellingly never seen or even referred to by name), before he ushers the girls into the car in a final futile attempt at escape. The events glimpsed at in the Mama’s opening are the film’s true horrors, and they tell us in no uncertain terms that class status is not a guarantor of parental success. The film’s more traditional, titular monster initially acts as the girls’ saviour, killing their father as he prepares to shoot them in the remote, abandoned cabin in which they have ended up. This cabin becomes a transitional space as the children are rescued from one horrific scenario and placed into another. Their subsequent upbringing by Mama is conveyed in the credit sequence, playing out over a series of what we infer are the girls’ drawings that depict their life with her. These credits work within the terms in which horror frequently depicts its “Terrible Children,” presenting an innocent perspective on matters that the audience may find inappropriately adult or horrific. Thus we are presented with drawings of dead animals as childish giggles are heard on the soundtrack; another shows one child vomiting as another looks on, a frown on her face. Yet the effect is oddly comforting, as these “horrors” do not compare with those we have just witnessed. If they depict a monstrous childhood, it is one preferable to the alternative. The narrative picks up five years later, with the two girls found living in feral conditions. Following rehabilitation and a court hearing, they are sent to live with Jeffrey’s brother, Lucas, and his reluctant girlfriend, Annabel, in a large, doctor-appointed home. This house (strangely reminiscent of the family manor glimpsed at in the film’s opening) is the alternative to the cramped apartment which Lucas and Annabel occupied when they were initially introduced. It is here where we first note the incongruity of the couple’s lifestyle with our notions of socially “suitable” parenting, with Lucas being a graphic artist, and Annabel, a guitarist for a rock band. Her initial immaturity is made evident during her first appearance, as she reacts to a negative pregnancy test with an elongated exclamation: “Sweeeet.” This seems more to be the response of a careless adolescent than what we can assume is a woman at least in her late twenties (although the ages of the two characters are not given, the actors cast as Annabel and Lucas are, respectively, 35 and 40). The tattooed, black-nailed, beer-swilling, candy-eating Annabel of the early scenes is explicitly immature, and this is signalled through her job and punkish costuming and demeanour. The film’s few humorous moments pivot around her initially clueless, profanity-peppered interactions with the children. Yet when Jeffrey, whose attachment to the girls is never in question, is hospitalised following an “accident,” Annabel is left as the sole caretaker of the girls - “we don’t got a choice” she tells them, evidently exasperated. The remainder of the film focuses on their developing relationships as much as the encroaching presence of Mama, detailing Annabel’s own acceptance of the maternal through her growing connection to Victoria and Lilly. Annabel’s discovery of the maternal coincides with a slight adjustment of horror convention, with Mama acting not quite as the “creepy kid” film that one might expect from the genre (or the opening credits). Victoria and Lilly are rarely the inscrutable “Othered” infants of The Omen (1976), The Innocents, or any number of supernatural horror films of the last fifty years. The film shies away from giving any credence to the notion that Mama is a creation of Victoria’s “dissociative personality disorder,” and the girls are not themselves figured as responsible for any evil action or intent, functioning only as the source of a couple of the film’s (frequent) jump scares. The notion that the girls can summon Mama is briefly flirted with during one of Victoria’s psychotherapy sessions with Dr Dreyfuss (Daniel Kash) - it is during this sequence that the Othered, sinister depiction of the child conforms most to the tendencies of the genre - but is never employed directly. Instead, the girls - Victoria in particular - are granted an atypical degree of subjectivity as their struggles to adjust to their new environment and the pressures of Mama’s return are dramatised. Their feral upbringing, raised outside civilisation by a figure we cannot define as human, means that the primary source of (their muted) “monstrosity” lies in their blurring of the boundaries between civilised - or “human” - behaviours and savage - “inhuman” - behaviours. This is particularly evident with regards to Lilly who, as the younger of the two girls, has no memory of any upbringing other than the one provided by Mama, and whose refusal to adjust to a new lifestyle is more heavily emphasised. The two girls are consistently contrasted: the girls’ arrival at the house shows Victoria to be well-dressed, but cuts to a close-up of Lilly’s bare feet as she emerges from the car. The children’s reaction to their new bedtime routine can be summarised by reference to a single shot that shows Victoria lying in bed while Lilly settles on the floor under it. The feral element of the narrative twists Mama into a tale of adjustment and adaptation; not only that of the girls, but of Annabel as she reluctantly assumes the role of guardian. Victoria’s adjustment to the social world is neatly conveyed through the device of her glasses, which reappear at several key points in the narrative. We see them break in the opening sequence at the shack, forcing on Victoria a distorted perspective of Mama and her subsequent upbringing. Her sight is returned to her when Lucas supplies her with a fixed pair of glasses at the rehabilitation centre, signalling the hope of a return to the “normal” world. At the film’s climax, Mama will again break the glasses in the hope that Victoria will return to her. By this point, however, Victoria is able to see what she could not before, and she remains in the human world with her new mother, Annabel. Thus, over the course of the film, Mama begins to lose her stronghold over the girls as Annabel’s own maternal instincts are awakened. Annabel’s efforts to reach out to the girls lead her to detect the presence of the competing mother figure. She approaches a crying Victoria in the bathtub, who warns her that Mama “gets jealous.” The act of grabbing the tassel on Victoria’s bathrobe as the latter attempts to leave the room seems aggressive, but it demonstrates Annabel’s growing attachment to the girls, and will reappear at the film’s climax as evidence of the strength of her newfound maternal instinct. Her progress with the more feral Lilly is figured on more primal, physical terms. Having discovered Lilly shivering in the back garden, the child having sneaked away to spend the night outdoors, Annabel restrains the hysterical girl and warms her by breathing on her hands. The musical score becomes gentle and emotional as Lilly, gazing into Annabel’s eyes, begins to mimic her action, breathing on her own hand. When a vengeful Mama finally takes action against the girls at the film’s climax, a brief shot shows Lilly breathing on her hands in the same manner. Yet it is Lucas who is granted custody of the children, and from the very start Jean is seen to lack any sense of maternal instinct. Jean emerges as a threat to both families, one that must be disposed of, given the film’s distrust of wealth and status as sufficient for raising a family. In her severe demeanour, Jean also raises issues concerning the more problematic configuration of suitable parents in the film; Lucas and Annabel, though comparatively poor and immature, are a young couple of child-rearing age, while Jean is middle-aged and single, though we are immediately given the impression that she is less suited to the position. This goes beyond status, and American cinema’s mistrust of the ageing female - particularly in the horror genre - is potentially at work here too. When Mama literally assumes the form of Jean near the film’s climax, the implicit monstrosity of the latter is overtly emphasised. It seems that most reviews of Mama have drawn attention to the novelty of the film’s climax, which sees Victoria united with Annabel and Lucas while Lilly, unable to adjust, plunges into the river with Mama. Ultimately, as Annabel crawls along the ground and grabs on to the tassel of Victoria’s robe, the film underlines the fact that the maternal instinct is the strongest of bonds - as the heroine of Rosemary’s Baby (1968) also discovered - one that can not be ruptured once it has calcified. The film’s true horrors derive from the girls’ true upbringing, and it is the two mothers who lack wealth and status that are deemed to be the most suitable. The maternal bond, once established, is thus deployed as one of horror’s most valuable and effective weapons. This Alternate Take was published on June 13, 2013.